The Symbiocity project rethinks the way prisons are built and operated in an effort to better criminal justice and rehabilitation systems. Traditionally, say the designers of the Symbiocity, prisons act like a parasite on cities, sucking resources but giving nothing in return. By locating prisons in city cores, they propose, prisoners are surrounded by society (instead of isolated in prisons located in rural areas), and therefore inspired to better themselves so they can reenter society. The Urban Earth Worm skyscraper uses one of the basest of creatures as its inspiration. 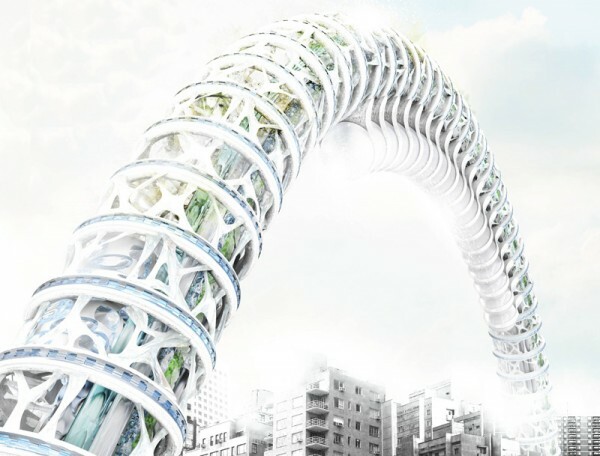 Just as earthworms clean the soil and solve pollution problems, promulgating life in thriving ecosystems, this skyscraper will clean air and soil pollution in cities and also feed cities – literally. 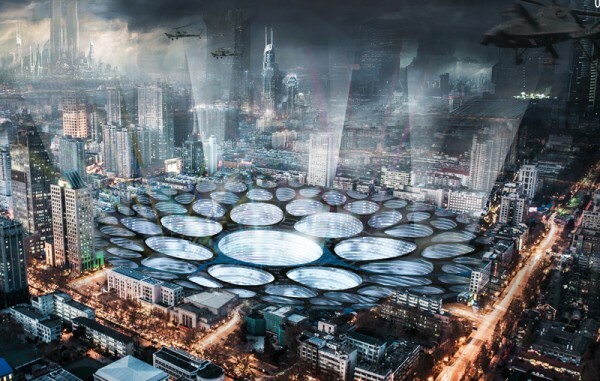 This project begins with the premise that Shanghai’s distribution of water resources is out of balance. The first problem is a lack of groundwater; according to the designers of the Water Re-balance tower, the people of Shanghai, in the quest for clean water, have taken so much water from under the city since 1860 that the city itself has sunk 1.7 meters in the past 40 years. Additionally, the water supplies that do exist today are largely polluted. Despite that shortage, the city does experience flooding in monsoon season, and the Suzhou River’s level can sometimes reach to the city’s streets. The Crater Scraper project is an imagined solution for the healing of the Earth’s surface as the planet suffers the impact of major asteroid strikes. Asteroid craters could be filled in with built settlements, holding communities of different sizes (depending on the size of the crater). As cities historically form at a core and extend peripherally, Crater Scrapers too have a central core that connects the settlement as a whole vertically and horizontally. Elevator systems link infrastructure vertically, from the bottom of the crater to the Earth’s surface; at the top, a separate transportation system links the community across the expanse of the filled-in indentation. At the bottom of the city, people traverse its length on foot. 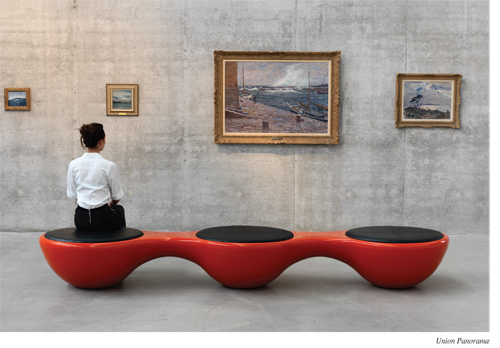 The Jangir Maddadi Design Bureau, a Sweden-based furniture design studio, has established a line of luxury benches, lamps and planters for interior and exterior spaces that are clean, aesthetically beautiful and utilitarian. All of the company’s products are crafted locally; using Swedish artisans to design and craft their benches, planters and lamps is a point of pride for the Jangir Maddadi Design Bureau. The company strives to compliment their prioritization of regional artisans and materials with designs that are organic and earthy. Innovation, they stress, and forward-thinking configurations and aesthetics are also vital in their products’ designs, though. Engineering students Lorenzo Carrino, Andrea Bonamore, Riccardo Franchellucci and Lorenzo Bramonti from Rome, Italy have created, from their historic city, a skyscraper plan that will allow people to move with ease from one world capital to another. The Mo.Ho., or Mobile Housing design incorporates moveable apartment units, “modules,” that are housed within Mo.Ho. towers or skyscrapers. 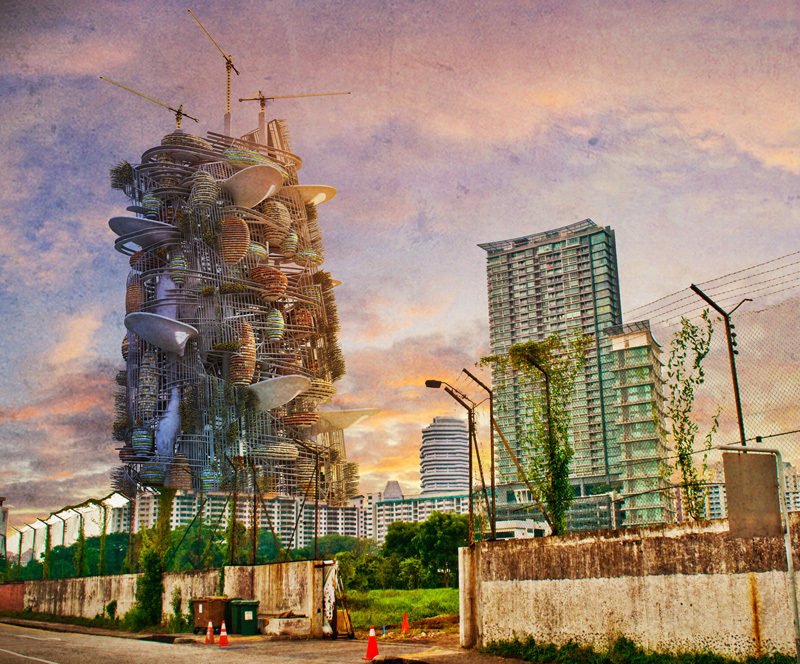 The towers range between 50 and 80 meters tall, and are built on top of existing structures in an effort to increase density without increasing the city’s covered surface area. 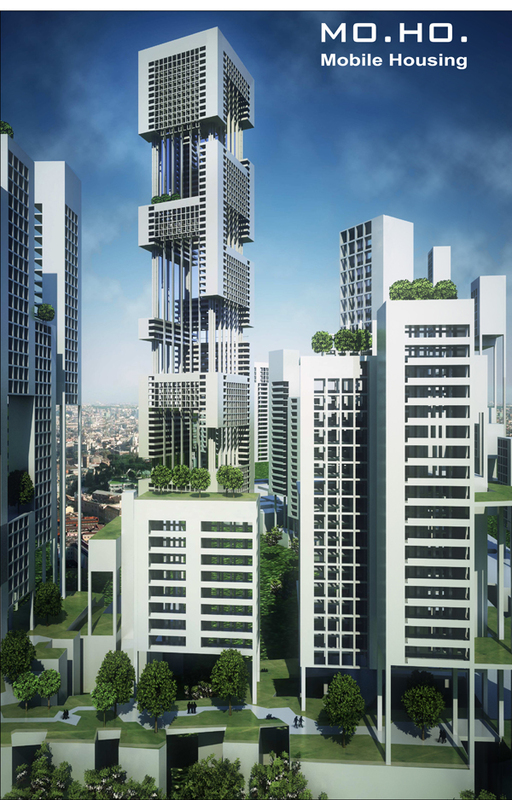 The skyscrapers are between 350 and 450 meters tall and can revitalized even the most “degraded” of urban areas, the students say. Their main draw is ample green space realized through green squares, public gardens and sports areas, which are connected via pedestrian green belts. 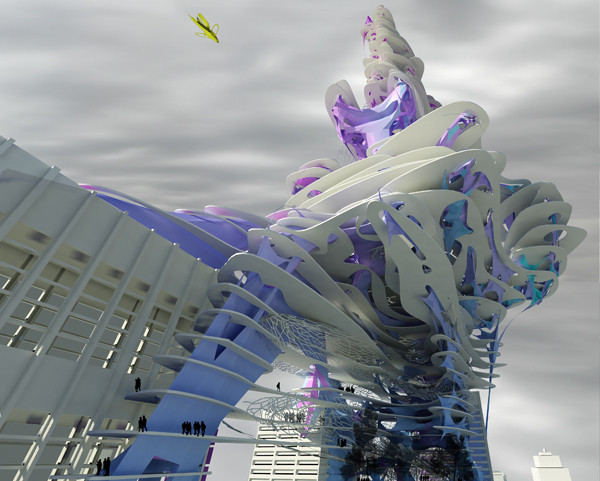 Imagine a giant, amorphous algae vine swallowing a traditional skyscraper. Now imagine living inside that growth. 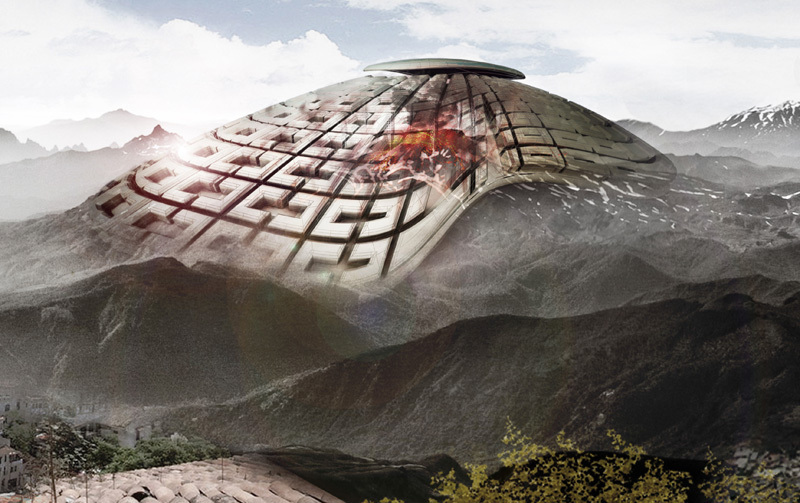 This is precisely what Polish architecture students Karolina Czochańska, Emilia Dekarz, Paweł Dudko and Justyna Krupkowska have proposed with their ‘Saprophyte’ design. In the future, they say, corporations will retreat to the virtual world, and communications will reach a height to where people no longer need to commute from work. 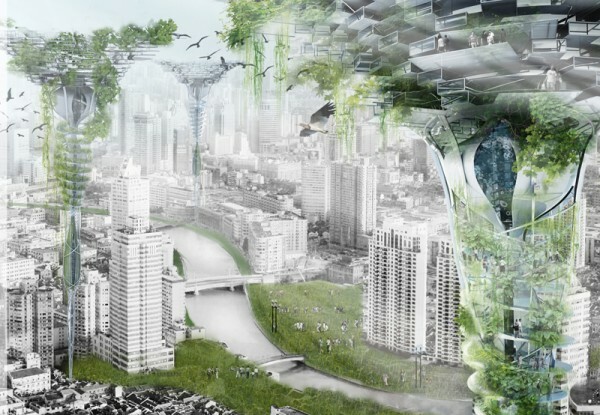 People will reclaim urban centers from the corporations that have abandoned them, and, working from home, will need to be served by a more adaptable, flexible and efficient living structure. Before modern structures as we know them were developed, man and animal lived together in nature. Gothenburg, Sweden-based architects Joakim Kaminsky, Fredrik Kjellgren, Maria Martinez Fabregas, Alexandra Agapie and Shadi Jalali Heravi with the firm SAR/MSA have proposed reinstating this original cohabitation, but in today’s modern, vertical context. Their concept, called “Alive Architecture,” imagines a skyscraper in Shanghai that houses both human and animal inhabitants within a building that blends the typical domiciles of both: modern building materials in the building’s core protect the building’s mechanical systems, but more primitive materials on the exterior, including wicker, straw, clay, mud and stone mimic a bird’s nest and earlier human building methods as well. Growing with stringy tentacles off of typical, rectangular high-rise towers is the Sky Cloud, a skyscraper that winds and grows from the ground into a twisting structure that resembles, at the top, an aquatic tail or fin.